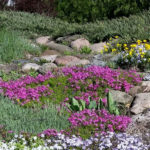 If you visited the Gardens in early May, you must have seen the gorgeous rock garden on 13th Ave SE as you go down the hill towards Munsinger. (It is across the street from the Virginia Clemens Rose Garden.) This garden was a blaze of color from blue and pink moss phlox and yellow “basket of gold” alyssum. If you go back for a visit later in the season, there will be dianthus and other plants blooming and the rock garden will look entirely different. Each plant has it’s “season” so that the garden will have a new look as the weeks pass.